The winning team, The Sea Horse Anglers Club Billfish Tournament, all smiles at the awards ceremony. A world record was set for the most billfish released in a tournament with a total of 2,840 billfish releases, including 2,822 sailfish, 14 blue marlin, two black marlin and two striped marlin. There were 13 qualifying dolphin, three wahoo and one tuna weighed over the 25-pound minimum by the time the scales closed on the final day. With less than 10 minutes to go in the tournament, only a few hundred points separated the top three teams. Two of those teams hooked up with just minutes left and ended up tied at lines out with 13,400 points each. After final review, the team representing the Sea Horse Anglers Club Billfish Tournament of Bermuda released their final fish three minutes before the team representing the Torneio de Marlin do Rio de Janeiro Brazil to claim the tie breaker and win the championship. After 1,900 minutes of fishing, it all came down to the wire on the last day in the last minutes of fishing. 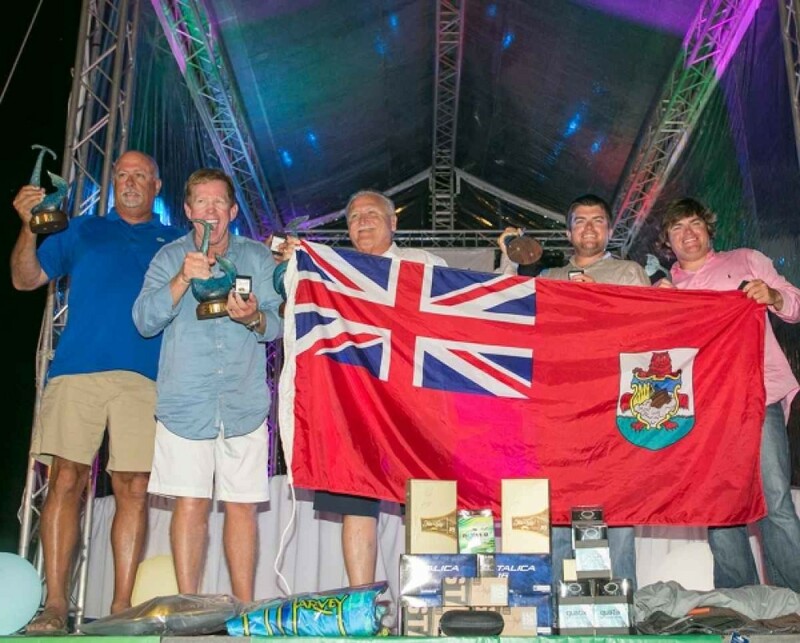 The team of American anglers qualified by winning the Sea Horse Anglers Club Billfish Tournament in Bermuda. The team caught 67 sailfish for a grand total of 13,400-points to win the 16th Annual 2015 Offshore World Championship (OWC). The anglers include Taylor Beckford, Rob Moore, David Berard and Frank Rodriguez. For their accomplishment the team received custom Championship rings from Vanmark Jewelry, Geoffrey Smith Bronze Trophies, Shimano Reels, Garmin Quatix watches, Guy Harvey limited edition prints, AFTCO Championship Apparel, Flor De Cana Premium Rum, Costa del Mar sunglasses, Tycoon Tackle Custom rods and Artic Ice cooler packs. As champions, they will also have the opportunity to apply to compete in the tournament for many years to come. Team member Taylor Beckford also picked up the 5th place angler award by releasing 24 sailfish for a total of 4,800 points and received a King Sailfish Mounts trophy and Guy Harvey limited edition print. The second place team from Brazil, which qualified for the OWC by winning the Torneio de Marlin do Rio de Janeiro, Brazil, scored a total of 13,400 points from 67 sailfish releases. Teammates included Marcelo Rodrigues, Joao Paulo Costa, Alberto Faria, Eduardo Castro and Luis Andre Rodrigues. Their experience paid off this year and earned them second place honors and prizes that include Geoffrey Smith Bronze trophies, Guy Harvey limited edition prints, Flor de Cana Rum, Costa del Mar Sunglasses, Garmin Virb Cameras, Tycoon Tackle custom rods, Shimano, reel, accurate reel and Artic Ice cooler packs. The second place team will be eligible to apply to compete in the 2016 Championship. The third place team, also from Brazil, which qualified for the OWC by winning the Torneio de Pesca Open 25, Brazil, scored a total of 13,300 points from 64 sailfish releases and one blue marlin. Anglers included Eurico Soares, Vicente Arruda, Alberto Quintaes, Marco Lips and Flavio Reis. The team’s prizes include Geoffrey Smith bronze trophies, Garmin Virb Cameras, Guy Harvey limited edition prints, Flor de Cana Rum, Costa del Mar sunglasses, Accurate reel and Artic Ice cooler packs. The third place team will be eligible to apply to compete in the 2016 Championship. 1st Place Tuna Bite – Captain Howard Lynch, 15,600-points wins King Sailfish Mounts Trophy, Guy Harvey Print, Flor De Cana Rum, Costa del Mar sunglasses, AFTCO Rod Belt, AFTCO gaff, TBF tag stick and Artic Ice cooler packs. 2nd Place Epic – Captain Michael Alligood, 15,400-points wins King Sailfish Mounts Trophy, Guy Harvey Print, Flor De Cana Rum, AFTCO Rod Belt, AFTCO gaff, TBF tag stick and Artic Ice cooler packs. 3rd Place Sea Fly – Captain David Mesen Gonzalez, 13,828-points wins King Sailfish Mounts Trophy, Guy Harvey Print, Flor De Cana Rum, AFTCO Rod Belt, AFTCO gaff, TBF tag stick and Artic Ice cooler packs. Top Boat/Captain based on best three days of fishing out of four. 1st Carlos Louro, VIII Blue Marlin Race Do CNL, 7,500-points from 35-sailfish releases and one blue marlin. Prizes: Shimano Reel, King Sailfish Mounts Trophy, Costa del Mar Sunglasses, Guy Harvey Limited Edition Print and Flor de Cana Rum. 2nd Christian Del Campo, Texas Women Anglers Tournament, 5,425.7-points from 27-sailfish and one 25.7-pound dolphin. Prizes: Accurate Reel, King Sailfish Mounts Trophy, Costa del Mar Sunglasses, Guy Harvey Limited Edition Print and Flor de Cana Rum. 3rd Albert Earl Klein III, Savannah Sport Club Bluewater, 5,000-points from 25-sailfish. Prizes: Accurate Reel, King Sailfish Mounts Trophy, Costa del Mar Sunglasses, Guy Harvey Limited Edition Print and Flor de Cana Rum. 4th Rafael Brigham, VIII Blue Marlin Race Do CNL, 4,800-points from 24-sailfish. Prizes: King Sailfish Mounts Trophy, Costa del Mar Sunglasses, Guy Harvey Limited Edition Print, AFTCO Rod Belt and Flor de Cana Rum. 5th Taylor Beckford, Sea Horse Anglers Club Billfish Tournament, 4,800-points from 24-sailfish. Prizes: King Sailfish Mounts Trophy, Costa del Mar Sunglasses, Guy Harvey Limited Edition Print, AFTCO Rod Belt and Flor de Cana Rum. 6th Corina Armando, Trofeu Marlins Bue, 4,400-points from 22 sailfish releases. Prizes: King Sailfish Mounts Trophy, Guy Harvey Limited Edition Print, Costa del Mar Sunglasses, AFTCO Rod Belt and Flor de Cana Rum. 1st Place Dorado with 52-pounds is Brian Bailey representing the Mississippi Gulf Coast Billfish Classic. Prizes: King Sailfish Mounts Trophy, Guy Harvey Print. 2nd Place Dolphin with 45.7-pounds is Paul Dozier representing the Casa de Campo International Blue Marlin Classic of The Dominican Republic. Prizes: King Sailfish Mounts Trophy, Guy Harvey Print. 3rd Place Dolphin with 45-pounds is Julio Magalhaes representing XV Grand Slam Sportfishing Tournament held in Angola. Prizes: King Sailfish Mounts Trophy, Guy Harvey Print. 1st Place Wahoo with 49.7-pounds is Beni Schvartz representing the Marina Open Torneio de Pesca nas Ilhas, Brazil. Prizes: King Sailfish Mounts Trophy, Guy Harvey Print. 2nd Place Wahoo with 34.5-pounds is Sam Worden representing the 2011 OWC Champions. Prizes: King Sailfish Mounts Trophy, Guy Harvey Print. 3rd Place Wahoo with 28-pounds is Leonardo Bochner, representing Torneio de Peixes de Bico, Brazil. Prizes: King Sailfish Mounts Trophy, Guy Harvey Print. 1st Place Tuna with 25-pounds is Travis Franklin representing the GFA of PNG National Titles, Papua New Guinea. 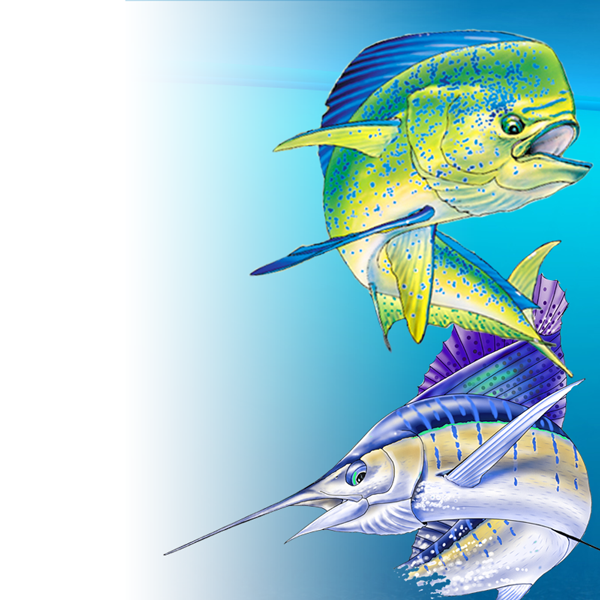 Prizes: King Sailfish Mounts Trophy, Guy Harvey Print. The tournament is sponsored by the Costa Rican Tourist Board (ICT) and Marina Pez Vela, along with Accurate, AFTCO, Arctic Ice, Costa, Down East Guide Service, Flor de Cana, Garmin, Geoffrey Smith Galleries, Guy Harvey, IWS Scales, King Sailfish Mounts, Marlin, Maverick Yachts, Mississippi Gulf Coast Billfish Classic, Parador Resort and Spa, Salt Water Sportsman, Shimano, Sport Fishing, Toyota Rent a Car, Tycoon Tackle and Vanmark Jewelry.